In this solo cooking adventure, Gary finally gets around to making something with the hunk of ground turkey sitting in his freezer. 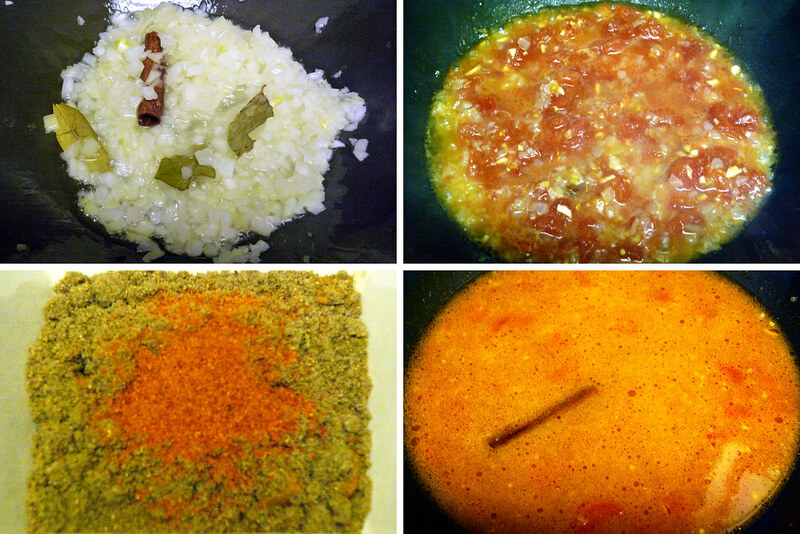 Top left – the sauce begins with some onions, bay leaves, and a cinnamon stick. Top right – canned tomatoes are added. Bottom left – ground coriander, tumeric, and garam masala. Bottom right – the spices and some water are added, forming the body of the sauce. A few months back, I made a pumpkin turkey chili after seeing a good recipe at Serious Eats. It called for a pound of ground turkey but the package I bought had well over three. I doubled the recipe, requiring two pounds of the turkey, and put the remaining pound-plus in the freezer. Fast-forward to a few days ago when I realized that I had a brick of ground turkey still sitting in the freezer, waiting to be turned into something delicious. I spent an hour searching a few websites for something to do with it besides making another chili (not a bad idea since it’s freezing outside). Finally, I just googled “ground turkey recipe” and found a site that had an index of recipes, leading me to the recipe at The Perfect Pantry that I would eventually use. Top left – turkey meatballs are formed. Top right – meatballs browning in the pan. 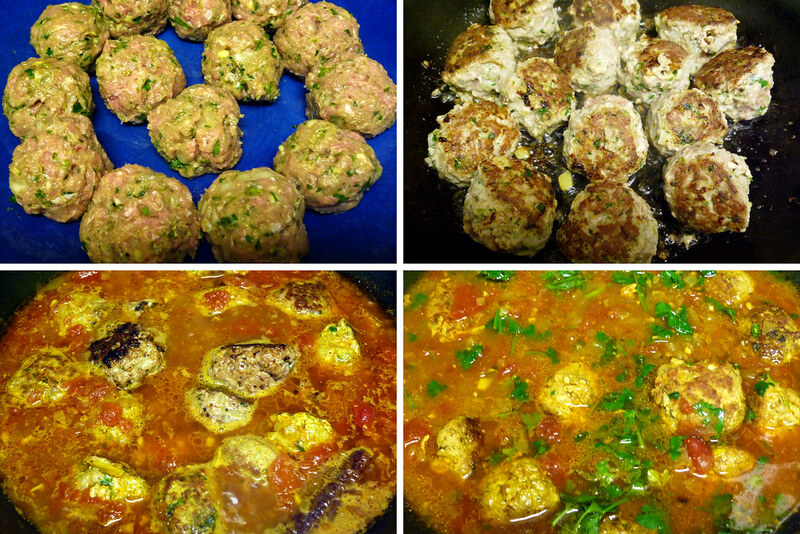 Bottom left – meatballs added to the sauce to simmer and finish cooking. Bottom right – chopped parsley is tossed in and is ready to be served. The best thing about this recipe (besides being absolutely delicious) is that it gave me the impetus to do some spice shopping. The recipe called for garam masala, tumeric, coriander, and cinnamon sticks – all spices common in Indian cooking. After consulting the Googles yet again, I took a trip to Kalustyan’s in midtown Manhattan. I can only describe this place as a wonderland for spices. Everything I needed was there, in abundant supply, and in varying amounts. Sure, buying in bulk will save you some moolah but even 4 ounces (their smallest size) was way more than I would need of any of these spices. I think it’s safe to say that I’ll be getting some mileage from my bounty. Cooking this recipe wasn’t difficult – the sauce takes some time to develop but it’s really a stir and wait sorta deal. I decided to deviate from the original recipe a bit, choosing to brown the meatballs first instead of just putting them directly into the sauce to cook. I was able to find a compromise between getting the texture I wanted on the meatball while making sure it was porous enough to let the sauce penetrate it. Since the turkey meatballs were softer and thus unable to stay round (they looked not unlike tall hockey pucks), I ended up browning only two sides of the meatball, leaving plenty of unbrowned surface area for the sauce to do its thing. After the meatballs simmer for a bit in the sauce, it’s ready to be ladled out and served over basmati rice. 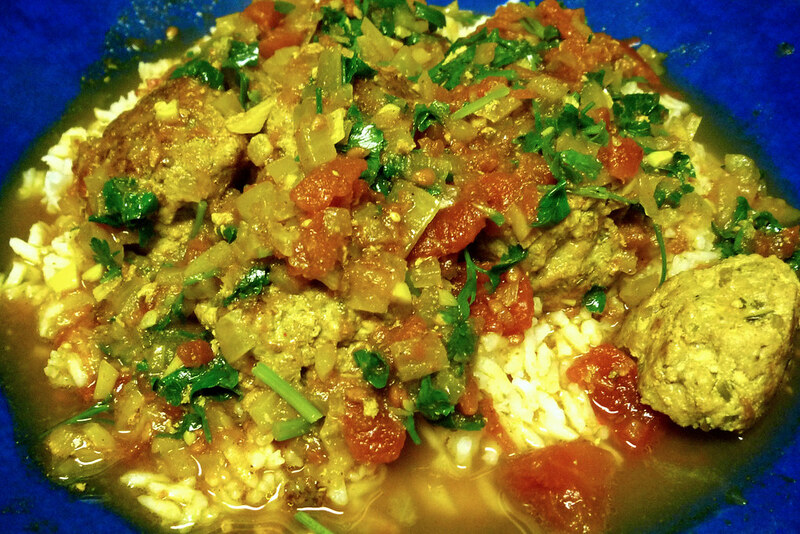 Curried turkey meatballs, plated and ready to eat. Mix all the ingredients for the meatballs in a large bowl. Work the mixture enough so that the ingredients are thoroughly incorporated. Form the mixture into meatballs approximately 1-½ inches in diameter. Set aside. In a deep sauce pan, heat the oil. Add the remaining onion, bay leaves and cinnamon stick, and saute over medium heat until the onions are golden brown (3-4 minutes). Add the tomatoes, ginger and garlic. Cook until the oil comes to the surface (4-5 minutes). Add 1 cup of water. Continue cooking until the water evaporates, stirring occasionally (3-4 minutes). Then stir constantly for 3 minutes; at this point the mixture will be a bit dry. Add the powdered spices and salt, and the remaining water. Bring to a boil, cover, reduce heat to simmer, and cook for 5-6 minutes. While the sauce simmers, heat enough oil to coat a frying pan over medium-high heat. When the oil is hot, set the meatballs into the pan. When the side of the meatball in contact with the pan is browned, turn the meatball over and brown the other side. Remove meatballs from the pan when the second side is browned. With the sauce having simmered and reduced a bit, set the meatballs into the sauce, cover, and simmer for 10 minutes, shaking the pan every 2-3 minutes to turn the meatballs and coat them with the sauce. Uncover the pan and continue to cook the meatballs for 3 minutes. Add the parsley (or cilantro), and shake the pan or gently stir. Serve hot or at room temperature. @mike You think so? What would you recommend to be the proper amount?